Venom is set to continue its box office invasion when it opens in China on November 2nd and Japan on November 9th. 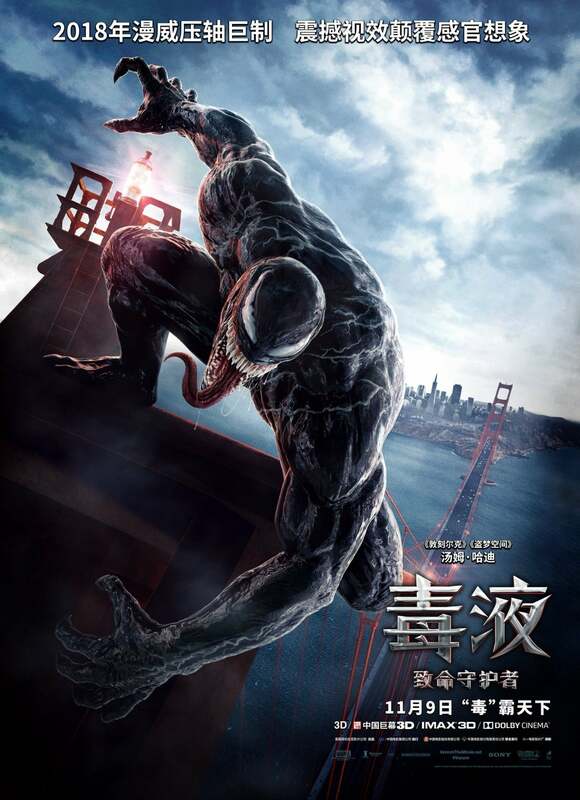 In order to promote those Asian market releases, Sony has put out a new Venom international clip and poster. While the one-sheet is a great piece of simple artwork capturing Venom in an iconic pose, the clip reveals a pretty pivotal part of the film: the introduction of She-Venom! "During the end of Venom's second act, Eddie Brock (Tom Hardy) is finally discovered and captured by the Carlton Drake (Riz Ahmed), and is transported back to the Life Foundation for study. Unfortunately for Eddie, his former GF Anne and her boyfriend Dan (Reid Scott) have just used an MRI machine to separate Venom and Eddie - and when Drake discovers that, he instructs his man Roland Treece (Scott Haze) to take Eddie out into the woods behind the Life Foundation and execute him. Eddie is on his knees about to get executed when he gets a miraculous save - from Anne, who tracked Venom through the hospital air ducts to where the symbiote was hiding in a small dog. Since Venom grows to like Eddie - and Anne - he decides to help out, and temporarily bonded with Anne in order to save Eddie. As She-Venom, Anne ruthlessly dispatches Treece and his men, and afterward, Venom quickly jumps back to Eddie. Anne is left slightly enamoured by the power she wielded as She-Venom - and slightly horrified that she bit one man's head off." "I actually only had one girl come up to me and say 'She-Venom... Man that is so cool.' Maybe once the movie [Venom] opens, then maybe more comic book fans will let me know more about this world... Gimmie a challenge." Venom is currently playing in theaters. The next Spider-Man movie will be the animated Spider-Man: Into the Spider-Verse on December 14th. It will be followed by the live-action Spider-Man: Far From Home, hitting theaters on July 5th.